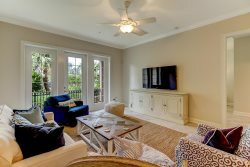 Discover what guests have to say about our stunning Amelia Island Plantation rentals! We enjoyed the facilities and were pleased that there was a pathway to the Ritz Carlton as our son andtheir family stayed there. We had three generations staying at the condo, for a total of 7 people. It was perfect and very comfortable for the group. The grandchildren loved being able to get to the beach easily and finding shells. We all enjoyed the large balcony for reading, talking and just sitting. The condo was very well equipped, with all the cooking, serving and dining equipment we needed. A very good time was had by all. Clean, spacious, had everything we needed. Overall our experience was great and usually is with this management company. We did find our carpets in our bedroom at check in to be full of shells and not looking vacuumed otherwise the rest of condo was very clean. A couple of days we were greeted with men at 9:00 in the morning to work on balaconies which took our privacy completely away those 2 days and inconvenient to say the least. Was not made aware they would be there and for how long. Otherwise we would still stay at properties by this management company because of ease to deal with and always has been positive in past years. knowledgeable, pleasant, efficient, prompt, accurate. Since my wife and i owned a business (Temporary ExecutIve Living) in Maryland for 20 years, I was impressed with the way you handledive the issue that came up a few days before out check in date. Apparently the original unit we were scheduled for was taken out of the rental pool by the new owner without much notice to you. Your team found another unit for us (and our dog, Fenway) without a lot of "drama". The problem went away as though it never happened. AND the owner of our unit gor an unexpected boost in revenue. WELL DONE! All communications were prompt and answered every question I had before arriving. Never worked with anyone personally. The staff at Amelia Island Rentals were very friendly and accommodating. We enjoyed our stay at 1123 Beach Walker. A few updates would be nice for the unit but it was very clean and a perfect place for our stay. Only suggestions are: 1. Leave more toilet paper than just two rolls for a weeklong stay; and more soap and shampoo (we ran out!) 2. Tops of couches were dusty...so housekeeping could have done a better job prepping.